I have created a new project for a Client, but can not find where to create jobs for the project. In TO3000 and Projetex, individual jobs are tied to projects, rather than to clients, and thus are created in the Project's window, rather than in the client's window. 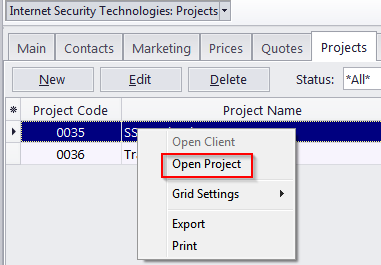 If you are in the Client window, right click the required project and select "Open Project". In the new window, move to the appropriate tab: Client Jobs (TO3000 and Projetex), Corporate Jobs, Freelance Jobs, Tree (Projetex only).